RAECO started concrete work because the quality of foundations and flatwork were not meeting our expectations. We are obsessive about delivering a final product that will hold up for years to come. Using laser screeds, robotic total station and 3D GPS imaging, our team has been able to eliminate human error from the process. When we pour a foundation, retaining wall, or parking lot, the final dimensions of the product are extremely precise. The robotic total station and 3D GPS imaging allow for extreamly precise finishes. With a laser screed we can work faster with less labor, saving you money. 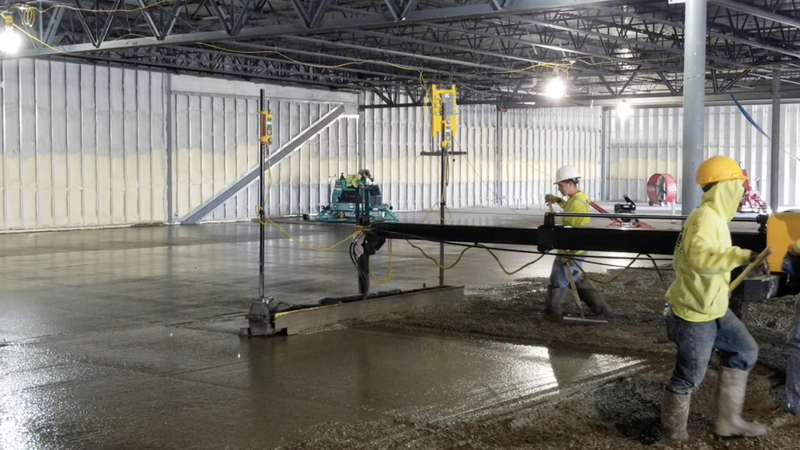 Because we use laser screeds and GPS imaging, our concrete team is only half the size of the teams needed for a traditional pour. With this equipment, we are also able to complete a job that would traditionally take 3 days in just 8 hours, often with just a single pour. Because we don’t have to pay a large team for 3 days of work, in some cases we are able to pour concrete for a price competitive with asphalt. Instead of pouring an asphalt parking lot that will need repaired in a few years, you will be able to have a beautiful concrete pad that will hold up for decades under high traffic.